Cavers Matt Hebley (left) and Steve Pawson stand in Starlight Cave, part of the Harwood cave system, in 1997. The cave lies at the head of The Gorge Creek, which issues from the marble of Tākaka Hill and flows into the Tākaka River. In October 1959, cavers looked for a way through to the subterranean stream that was found at the bottom of Harwoods Hole, on Tākaka Hill. 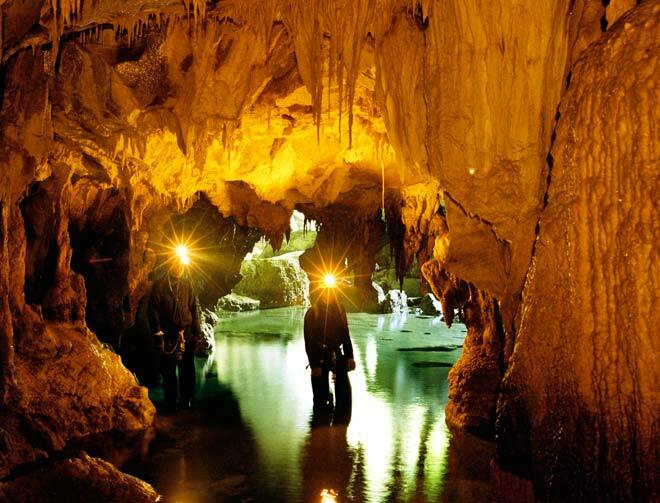 Starlight Cave was named by Kevin Blythell, and refers to the play of reflected light from the first explorers’ lamps on the crystal floor and walls.